A stunning reissue of a bestselling, classic novel from the author of The Joy Luck Club and The Hundred Secret Senses.LuLing Young is now in her eighties, and finally beginning to feel the effects of old age. Trying to hold on to the evaporating past, she begins to write down all that she can remember of her life as a girl in China. Meanwhile, her daughter Ruth, a ghostwriter for authors of self-help books, is losing the ability to speak up for herself in front of the man she lives with. LuLing can only look on, helpless: her prickly relationship with her daughter does not make it easy to discuss such matters. In turn, Ruth has begun to suspect that something is wrong with her mother: she says so many confusing and contradictory things.Ruth decides to move in with her ailing mother, and while tending to her discovers the story LuLing wrote in Chinese, of her tumultuous life growing up in a remote mountain village known as Immortal Heart. LuLing tells of the secrets passed along by her mute nursemaid, Precious Auntie; of a cave where dragon bones are mined and where Peking Man was discovered; of the crumbling ravine known as the End of the World, where Precious Auntie's bones lie, and of the curse that LuLing believes she released through betrayal. 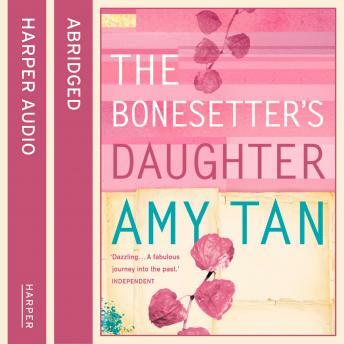 Like layers of sediment being removed, each page unfolds into an even greater mystery: Who was Precious Auntie, whose suicide changed the path of LuLing's life?Set in contemporary San Francisco and pre-war China, The Bonesetter's Daughter is an excavation of the human spirit. With great warmth and humour, Any Tan gives us a mesmerising story of a mother and daughter discovering together that what they share in their bones through history and heredity is priceless beyond measure.